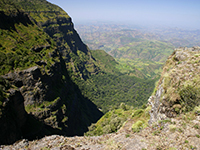 Ethiopia is a beautiful country to visit, featuring sublime National Parks such as the ones at Simien Mountains, Mago and Yangudi Rassa, as well as the stunning Blue Nile Falls. The Foreign Commonwealth Office (FCO) advises against all travel to several sections of Ethiopia, including within 100km of Ethiopia’s borders with Somalia and Kenya, as well as in the Afder and Liven zones of Ethiopia’s Somali region. Travellers will need to scrupulously study their planned destination and assess what advice is in place regarding safety. You will also need to check which areas of Ethiopia are only advised to go to for essential travel. Airplane is the only method of transport from the United Kingdom, with journey time depending on which airline you use and how many stops the aircraft makes. From London to Addis Ababa Bole International Airport, a non-stop flight would take around eight hours, while a one-stop flight would extend that, on average, to between 10-13 hours. Travel is also dependent on where your stops are, with a two-stop flight taking anywhere between 13 and 30 hours. The time difference in Ethiopia is two hours ahead of British Summer Time and three hours of Greenwich Mean Time, which should not result in too much altering of your diabetes management. If you are unsure as to how to manage your medication then you should discuss a plan with your diabetic specialist. Ethiopia is very humid, but the average climate is by no means unmanageable for travellers, which generally remains at around 15°C all year. The heat can still reach much higher temperatures throughout the year, which can lead to enhanced insulin absorption if you are engaging in any physical activity. It is therefore critical to regulary check your blood sugar levels if you take insulin. If you are undertaking physical activity, you could consider reducing your dosages. The currency used in Ethiopia is the Ethiopian Birr. It is advised to obtain currency before you depart the UK to secure the best rates, while credit and debit cards will not be recognised by ATM machines in Ethiopia. For this reason, it's best to bring cash and traveller cheques. There are no mandatory vaccinations to enter Ethiopia, however several are highly recommended. You should consult your doctor eight weeks prior to your departure in order to receive the vaccinations in time. All travellers are recommended to get vaccinations for hepatitis A, polio and typhoid. Hepatitis A and typhoid can be contracted through contaminated food or water. Polio, meanwhile, will be required if you were vaccinated as a child but have not had a polio booster as an adult, or if you were not completely vaccinated as a child and do not know your vaccination status. If you plan to be in Ethiopia for more than four weeks, the Ethiopian government may require you to show proof of polio vaccination when exiting the country. Some travellers are also recommended to receive vaccinations for other diseases, including hepatitis B and rabies, which can be carried by dogs, bats and other mammals in Ethiopia. Yellow fever is a risk in certain parts of Ethiopia, so it is recommended that travellers under the age of nine months should receive immunisation. The government of Ethiopia also require proof of yellow fever vaccination if you have travelled from a country with a risk of yellow fever. Vaccination against meningitis is recommended for travellers planning to visit Ethiopia during its dry season of December–June, in which the disease is most common. UK citizens with diabetes will not be entitled to any free medication services while in Ethiopia. Securing comprehensive medical insurance will be essential in order to obtain even basic treatment. Diabetic medication is available in Ethiopia, but payment will be required from all pharmacies. Blood and urine testing kits are available, however there may occasionally be shortages. For this reason it is especially wise to bring a second metre with you and store it away from your main metre in case you somehow lose it. The emergency services number to call in Ethiopia is 122180. It is worth checking with the manufacturer of your meter in the UK if the particular equipment you require is available in Ethiopia beforehand and if it is sold under any different names. You should note which syringes are available in Ethiopia, with U-40 and U-100 syringes the most commonly used. How is blood glucose measured in Ethiopia? Unfortunately, we do not have the information of whether blood glucose is measured in mg/dl or mmol/l in Ethiopia. What language is spoken in Ethiopia? Amharic. It is important to learn basic Amharic phrases as a minimum requirement before entering Ethiopia. Only very basic English will be spoken so you will need to research the language to help you in your day-to-day activities.